he health benefits of eucalyptus oil can be attributed to its anti-inflammatory, antispasmodic, decongestant, deodorant, antiseptic, antibacterial, stimulating, and other medicinal properties. Eucalyptus essential oil is colorless and has a distinct taste and odor. Though eucalyptus essential oil has most of the properties of a typical volatile oil, it is not very popular as an aromatherapy oil as it was little known before a few centuries. However, the numerous health benefits of eucalyptus oil have attracted the attention of the entire world to explore its usage in aromatherapy as well as conventional medicine. Eucalyptus essential oil is obtained from fresh leaves of the tall evergreen eucalyptus tree. The tree, which has the botanical name Eucalyptus globulus is also known as fever tree, blue gum tree or stringy bark tree. Eucalyptus is native to Australia and has spread in the past few centuries to other parts of the world including India, Europe and South Africa. Though many countries produce eucalyptus oil in small quantities, the prime source of eucalyptus oil for the world is Australia. * Respiratory Problems: Eucalyptus essential oil is effective for treating a number of respiratory problems including cold, cough, running nose, sore throat, asthma, nasal congestion, bronchitis and sinusitis. Eucalyptus oil is antibacterial, antifungal, antimicrobial, antiviral, anti inflammatory and decongestant in nature which makes it a good ingredient for many medicines for treating respiratory problems. A study published in Laryngoscope in 2004 shows its usefulness in treating non-bacterial sinusitis. Patients suffering from non-bacterial sinusitis showed faster improvement when given medicines containing eucalyptus oil. Gargles of eucalyptus oil mixed with warm water are effective on treating sore throat. * Wounds: Eucalyptus essential oil is a good antiseptic owing to its germicidal properties. On its exposure to air, ozone is formed which is a well-known antiseptic. Hence eucalyptus oil is used for healing wounds, ulcers, burns, cuts, abrasions and sores. It is also effective on insect bites and stings. * Muscle Pain: During muscle and joint pains, massaging eucalyptus oil on the skin surface helps in getting relief from the pain. The volatile eucalyptus oil is analgesic and anti inflammatory in nature. Therefore it is often recommended to patients suffering from rheumatism, lumbago, sprained ligaments and tendons, stiff muscles, aches, fibrosis and even nerve pain. The oil is massage in circular motion on affected areas. * Mental Exhaustion: An important reason why people like using eucalyptus oil is that it provides a cooling and refreshing effect. Normally people suffering from any disorder are down. Eucalyptus oil, which is stimulating, removes exhaustion and mental sluggishness and rejuvenates the spirits of the sick. It is also effective in treating stress and mental disorders. * Dental Care: Eucalyptus essential oil is very effective against cavities, dental plaques, gingivitis and other dental infections due to its germicidal properties. 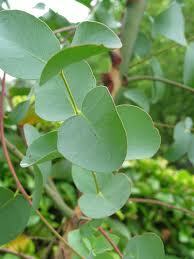 * Eucalyptus TreeSkin Care: Eucalyptus oil is often applied topically to treat skin infections. * Diabetes: Eucalyptus oil when taken internally controls blood sugar. * Fever: It is also used for treating fever and reducing the body temperature. Therefore it is also called fever oil. * Intestinal Germs: Eucalyptus oil is a vermifuge and hence is used to remove germs in the intestine. * Room Freshener: The antiseptic and deodorant nature of eucalyptus oil makes it a perfect room freshener for hospitals and sickbed atmosphere. It also kills bacteria and germs in the air and hence keeps the room environment clean. * Soaps: Eucalyptus oil has applications in soaps, detergents and household cleaners as well. * Mouth Wash: As mentioned above, the oil is a prime ingredient in many mouthwashes and toothpastes. * Sauna: Many people add eucalyptus oil to baths, spas and saunas due to its refreshing and antiseptic effect. Usage of eucalyptus oil in aromatherapy is increasing gradually as it also blends well with many other essential oils including thyme essential oil, rosemary essential oil, marjoram essential oil, lavender essential oil, cedarwood essential oil, frankincense essential oil, etc. One should take care while using eucalyptus oil. If taken in large quantities, eucalyptus oil is toxic. It may also interfere with homeopathic treatments.